a social investigation about the future of Italy's small islands. 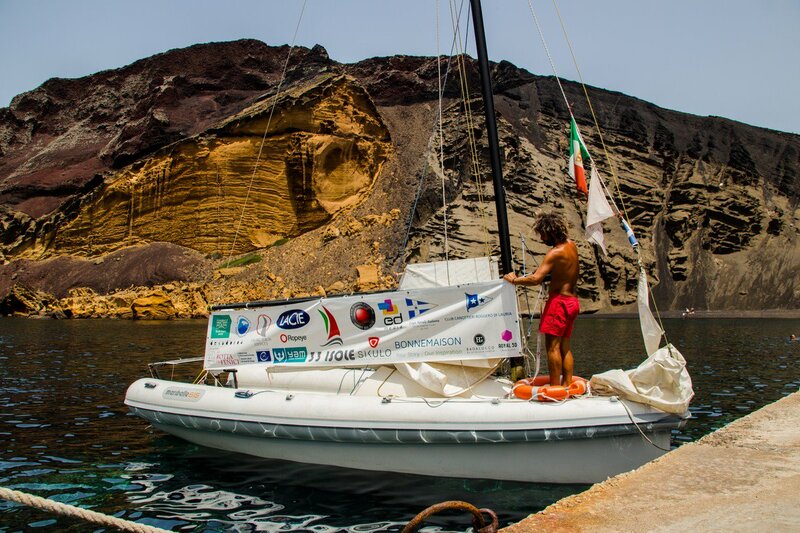 Lucio sailed 2800 nautical miles in slightly more than 4 months onboard Maribelle, a hybrid sailboat in-between a sailboat indeed, a rubberboat, and a windsurf. She is 6.15 m long and has no cabin. He always sailed alone, at day as well as at night, halting only twice during a given leg. In both cases, the reason were dangerous meteorological conditions which arose while sailing. Such unaccounted stopovers are highlighted in yellow in the itinerary table. Lucio stopped in all Italy's inhabited islands (put aside Sicily and Sardinia) with only two exceptions: the Tuscan Archipelago National Park refused him and Maribelle the landing in Pianosa and Gorgona; and 3 islands only were chosen among all those present in the Venetian Lagoon. In the islands, the average stay lasted 2 days and a half. In only a few cases bad weather forced Lucio to postpone his departure. During every stay, Lucio interviewed mainly young people able to witness, through their experience and personal story, about the central theme of the investigation: the "future" of Italy's small islands. The total number of interviews accounts to more than 90. In many islands, a small filming troupe was waiting to help Lucio with the interviews: the Peruvian director Donald Wilson, an employee of the American communications company Bonnemaison Inc. (in order Brooks Moore, Hannah Oneda, Mari Bonnemaison, Annelise Moore and Curtis Mariano), and the photographer/production manager/much more Elisa Manganelli. The Peruvian photographer Daniel Ducato was also present at the beginning of the journey. In the other islands, instead, Lucio made the interviews by himself alone.